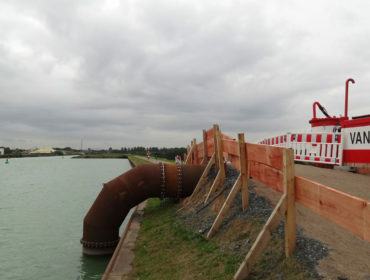 The German joint venture of Depenbrock Bau GmbH & Co.KG and Hecker Bau GmbH & Co. KG commissioned Van Heck, on behalf of the WSV (Federal Waterway and Shipping Administration), to supply a siphon system for water management during the construction of the new spillway of the Dortmund-Ems-Canal near Greven. In this case a siphon system is a very suitable solution as the Dortmund-Ems-Canal is higher than the drainage point. Furthermore, no fuel is needed for a siphon system, which makes this an energy-efficient and cost-effective solution. The siphon system, with a diameter of 1000 mm and a 260 m long pipeline, is operated by the employees of WSV according to the instructions of Van Heck. The new construction project is expected to last until the end of 2018.